The University of Wisconsin Track & Field team won its 4th straight Big Ten Outdoor Track & Field title and the 10th in the last 13 years. It&apos;s the 23rd title for Coach Ed Nuttycombe, giving him more titles then any other Big Ten Track & Field coach. It also gives the Badgers a record 4th straight "Triple Crown". It&apos;s also the 10th in all and 9th in the last 13 years. 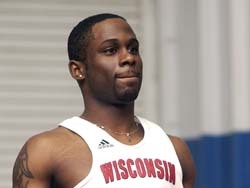 Demi Omole (pictured) set his own Big Ten record, winning his fourth-consecutive title at 100 meters. He ran a season&apos;s best time of 10.19 seconds to become the first conference athlete to win four-consecutive titles in the 100-yard dash or 100-meter dash. Omole also added his first Big Ten title in the 200 meters, running a season&apos;s best time of 20.92. The senior from Milwaukee wraps up his career as an 11-time Big Ten champion, just one short of the UW record of 12 titles won by Don Gehrman from 1947 to 1950.